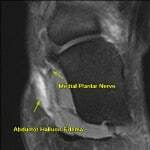 A patient presented with pain and instability of the ankle. During physical examination it was revealed that the ankle pain was chronic and not healing for more than a year post-trauma. 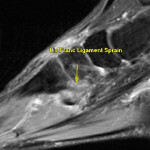 The patient experienced instability, weakness and a decreased range of motion compared to the opposite ankle. The physician ordered a 3T MRI to include specialty sequences utilizing a dedicated specialty 8-channel ski-boot foot and ankle coil. 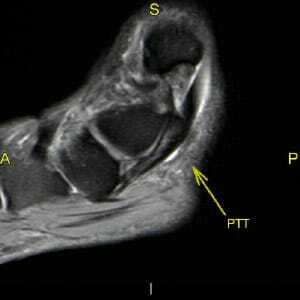 Extremely high resolution images were obtained which aided the subspecialty radiologist’s diagnosis of multiple pathologies including “cortical thickening of the calcaneus at Gissanes angle”. 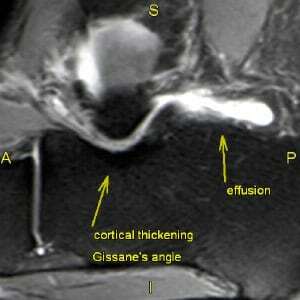 Images representative of the study are presented below with pathology clearly labeled and annotated. 1. Hindfoot valgus with midfoot sag with resulting subfibular impingement as evidenced by soft tissue edema inferior to the fibula, cortical thickening of the calcaneus at Gissanes angle, edema within the lateral aspect of the tarsal sinus. Intact posterior tibial tendon and spring ligament. 2. 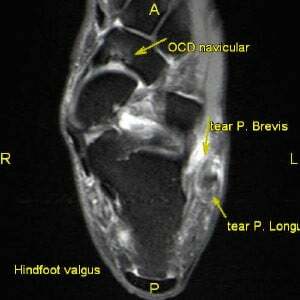 Tearing of the peroneus brevis and peroneus longus tendons at the fibular tip and proximal to the cuboid groove, respectively. Peroneal tenosynovitis. 3. 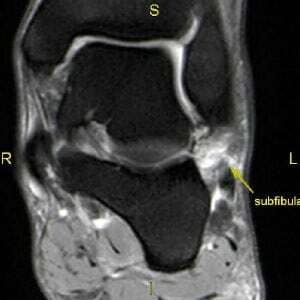 Remote osteochondral lesion of the proximal aspect of the navicular bone secondary to prior injury. Superimposed talonavicular secondary osteoarthritis. 4. 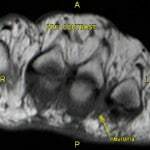 Moderate tibiotalar joint effusion with communication with the posterior subtalar joint.